SEAMAN JOB INFO - SOLPIA MARINE IS Updated requirements as of Nov. 16, 2018 hiring Filipino seaman crew for join on bulk carrier, oil tanker vessel. Same vessel experience required. MASTER - handysize dep. last week nov.
1/AE - handy, full crew, dep. last week nov.
2/AE - 1st week Dec.
Share to help other seaman looking jobs at sea. 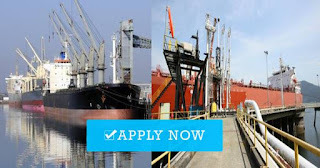 Apply for the highest paid maritime jobs in our area now. Apply online today. Get free job alerts. Find your next job. 0 Response to "Cook, O/S, Oiler, 2/E, 1/E, Master For Tanker, Bulk Carrier Vessel"